This MGA 1600 roadster left the Abingdon factory with a shiny white body and a red interior, destination USA. Its further history is unknown, but it is clear that it had its fair share of abuse and neglect. It is now in dire need of a thorough restoration. 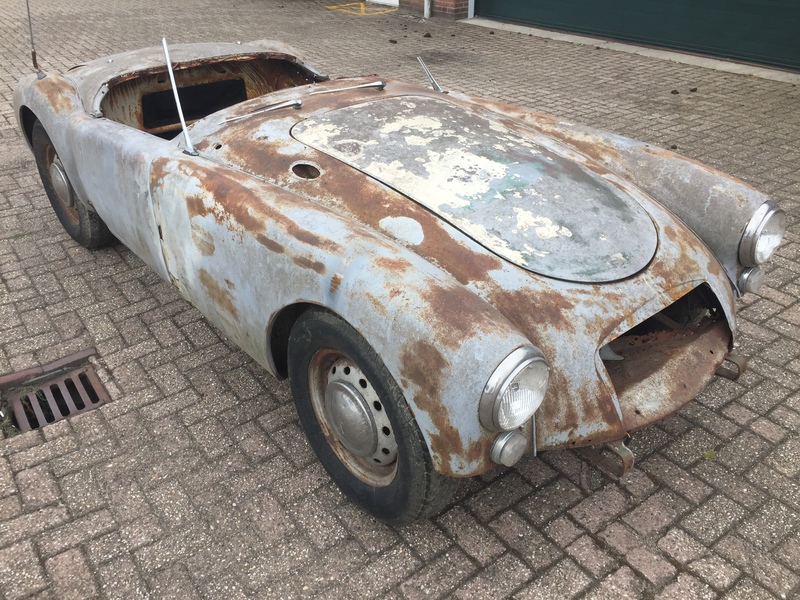 The MGA has severe rust damage on both the chassis frame and the body. The chassis will need a thorough restoration, with new central side members, front crossmembers and a complete set of floorboard rails. The body has rust damage in all of the common weak spots: sills, lower front and rear fenders, boot floor and radiator duct panel. The front valence panel is missing. The lower inner door sections are rusted and thhe left hand door is severely damaged. The VIN plate still shows the chassis number, although it is heavily weathered. Also, the body number is still attached. Technically everyting on this MG should be rebuilt. The engine is frozen. Based on the engine number, we assume it is the factory original power plant. Standard 4 speed gearbox and steel wheels (spare wheel missing). The car is incomplete, missing the seat frames, convertible top frame, side screens and several trim items. It shows a mileage of 72.731 mls. When we acquired this MGA, it did not have a US title. We have paid import duties at the EU border and will include the customs certificate. Furthermore, the car will be sold with only a commercial invoice. We advise the next owner to apply for a heritage certificate, to add as an official document with the registration process. We can deliver this car throughout Europe at competitive rates. Contact us for a shipping quote. We have a large stock of new MGA car parts at competitive prices. They can be ordered in our webshop. Go back to our collection page, to see our current stock of classic cars for sale.